Win A Russell Hobbs Fruit & Veg Spiralizer – Create, Make & Bake! 18th February 2018 22nd February 2018 - by Lydia - 171 Comments. I owned a spiralizer many years ago, but it was a hand-held one. The children loved putting the fruit and vegetables into it. One of their favourite things to do was cucumbers. Their arms would get tired well before it was finished, but the len gh they got to was amazing. It really encouraged them to eat more fruit and vegetables as well. I think it’s one of the kitchen tools that’s never at the top of your list to buy. I never really considered buying a spiralizer as I didn’t think it would get much use. When we got one as a present I thought we might as well try it once, but we used it until it finally broke. 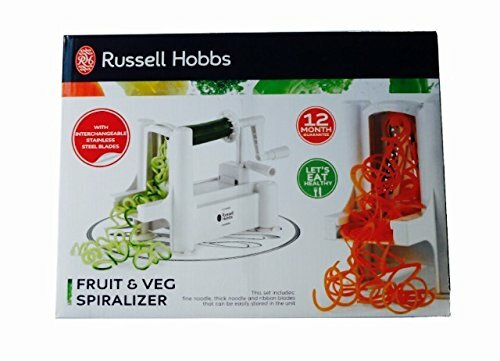 I’ve got a Russell Hobbs Fruit & Veg Spiralizer to give away today. Enter below. My slow cooker! I love it! My most useful gadget currently is my soup maker. It’s a great way of getting veg into the kids and it happens to be very quick and simple to use. At the moment, my oven is broken. Therefore, my microwave is a life saver! our remoska oven from Lakeland !! A hand blender that I use to make soups and dips- so useful! I’d say my slow cooker! So easy to add things and just let it go! My Acti fry lots of chips without the guilt! My most useful gadget is my food processor. My damaged hands won’t let me do simple things like make pastry so having this does all the hard work for me. It would have to be my salad spinner, i hate washing lettuce and my dad gave me his old one and i love it! I would have to say my kettle. It’s something I have always taken for granted until it broke and I had to boil water in a saucepan to make coffee. It took soooo long! I love my smoothie maker, it’s lovely in the summer being able to make a cool smoothie full of nice fresh fruit. Russell Hobbs mini blender set that husband purchased 2 years ago, it chops, blends and best bit is I don’t lumps in my soup! My Hand mixer. It has a whisk, a bread hook & cake beaters & I use it several times a week. The kettle! Well, who could live without morning coffee?!!! I have just had to google this. How did I not know that there was such a thing? My slow cooker, always lovely to come home to fabulous aroma and food already cooked. My turntable cake decorating stand is my most useful kitchen gadget as I love baking and decorating my own cakes. Our microwave oven – extremely useful. Not something I’ve considered but I have seen alot of courgette spaghetti popping up so could be a decent item. It would probably be my juicer but I couldn’t imagine life without my kettle. My mini food processor as it’s so useful and my kettle, I love my tea! I splashed out on two Japanese “Damascus” knives and a westone. They are very beautiful and VERY sharp, makes prep a doddle. I’ve had my eye on some of them for a while. It was my husband who originally mentioned them. definitley my air fryer its amazing . i toyed with the idea of getting one for ages and then i saw it on offer so bought it and im so glad i did its amazing i do so much in it from sausages to sweet potato fries and loads more. whish i had bought it years ago. My food processor, it is great! My slow cooker, it makes life so easy. The most useful thing in our kitchen is a Kenwood mixer – great when we are making cakes! We have got a ‘Ninja’ which we use a lot. Most used gadget would be my electric whisk, saves your arm when making meringues ….and cakes….and whipping cream and chocolate….all healthy options, think I could do with this spiralizer to make some healthier choices! My slow cooker, is it is so handy that you can make a stew or casserole in the morning and just leave it to cook all day whilst at work. My steamer is fantastic! Can cook a whole dinner!! The most useful gadget I have in my kitchen is my slow cooker as it allows us to have warm, scrumptious meals ready for when I get home from work. My cheese grater – I do likes me cheese! My slow cooker! so handy for our family of six when at work and school, saves a lot of time. Our slow cooker! It’s so easy, prep in the morning and fuss free tea ready in the evening! My hand blender……it has helped me hide sooooo many veggies in my sons dinners. It has to be my electric kettle. I love drinking cups of tea, I couldn’t survive without tea. My hand blender comes in useful. My citrus juicer. I use it every morning to make fresh orange juice and I love it. My oven! With 3 constantly hungry teenagers to feed, I can’t imagine life without it. In this cold weather it has to be the kettle!